To be reviewed over at Fresh Fiction! Kandice Miles Allie wrote: "I love what you said about the book showing the reality of the 1920's! That's one of my favorite things about it too. The characters fel Allie wrote: "I love what you said about the book showing the reality of the 1920's! That's one of my favorite things about it too. The characters felt like real, identifiable characters living in a different ti..."
I’ll admit it. I’m a sucker for novels about Old Hollywood. Just love ‘em. 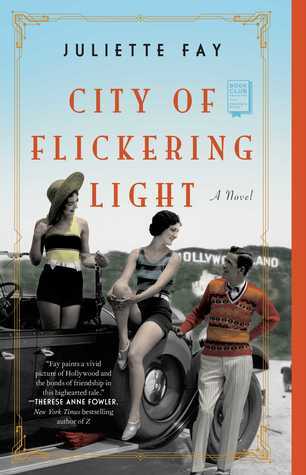 And Juliette Fay’s new historical gem, “City of Flickering Light” is no exception. I don’t believe it’s too early to prognosticate that this will be the beach read of the 2019 season. Irene, Millie and Henry all work for the same burlesque troupe. They are not-quite-friends but more than acquaintances. Irene is the seasoned veteran, having once been part of a sister-act with her twin, Ivy. Mil Absolutely. Loved. This. Book! Irene, Millie and Henry all work for the same burlesque troupe. They are not-quite-friends but more than acquaintances. Irene is the seasoned veteran, having once been part of a sister-act with her twin, Ivy. Millie is the innocent ingénue, someone who needs looking after, and Irene takes on that burden. Henry is the new guy, the bad comedian all burlesque troupes seem to have. One day in July 1921, Irene decides that she had had enough. She’s quitting the business and heading for Hollywood. Flickers, or silent movies, are the rage. She hatches a plan where she and Millie jump off a moving train, just like theater-goers saw in those early films. She didn’t count on Henry following them, and she didn’t count on the boss sending his muscle to find them. After a harrowing escape, the trio makes their way to the land of eternal sunshine and set about becoming a star. It’s not as easy as it looks. Author Fay takes readers on a journey of bad, but cheap, boarding houses; lining up outside the studio, hoping and praying, they’ll catch the eye of an assistant director; traipsing around after dark, trying to make that all important connection in whatever speakeasy they can find. Their adventures kept me up way past my bedtime for three nights. One of the things that I really like about the novel was that Fay didn’t shy away from the sordid side of the casting couch and other indelicate secrets that only appeared when one looked beneath the surface of the glamour and fame….if you made it. The only thing I didn’t like about this book was the ending. It just kinda stopped. I had really gotten to know these characters, had developed a bond with them and wanted to know how it all turns out. Fingers crossed that there will be a sequel. If not, I’ll pretend I’m a movie star and make my own happy ending. “City of Flickering Light” receives 6 out of 5 stars in Julie’s world.